Last year, while on vacation in the Provence region of France, I fell in love with a number of regional favorites, including Salade Niçoise, socca and French rosé wines. Salade Niçoise, a specialty of Nice, is basically a mixed-green salad topped with tuna, tomatoes, olives, onions and any number of other ingredients, including hard-boiled eggs, radishes and even anchovies. A more portable – but equally enjoyable – version of that salad comes in a sandwich, called Pan Bagnat. Upon returning home, I recreated the salad a few times, but it wasn’t until I saw a recipe in Gabrielle Hamilton’s cookbook Prune that I thought to try the sandwich version. While her recipe doesn’t call for hard-boiled eggs or even any greens, you could certainly add those. But you won’t really need to, as this recipe is pretty amazing on its own. 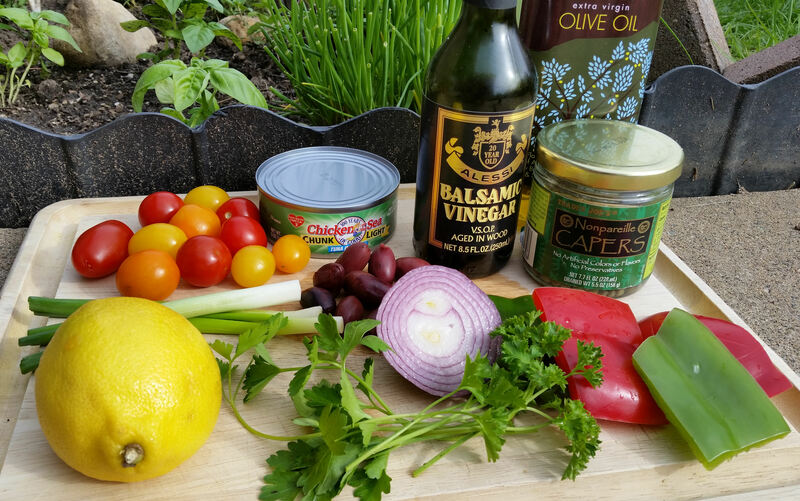 And packed with tuna, olive oil, olives and other colorful veggies, talk about heart-healthy! The measurements and quantities below are just a general guideline: feel free to add more or less of any of the ingredients to make it your own. Pair this with a chilled, dry rosé and it becomes a summer meal you’ll come back to time and time again. 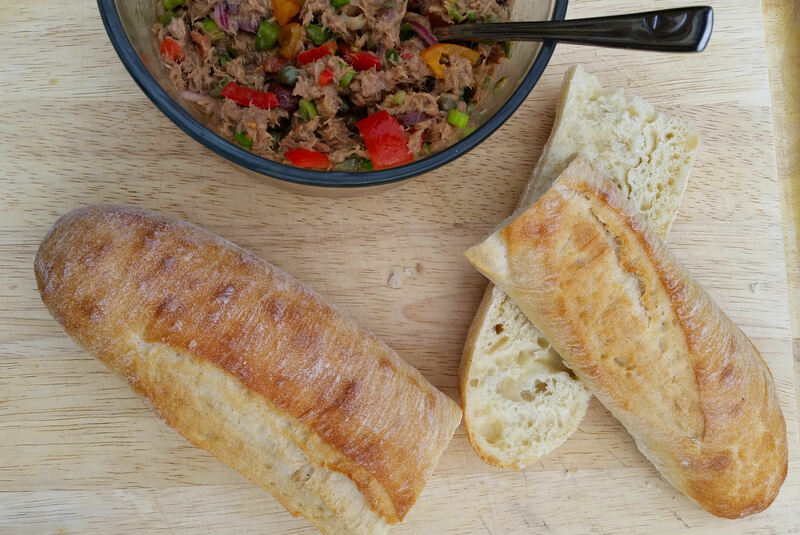 Combine tuna, balsamic vinegar and lemon juice in a large bowl; mix well. Stir in all the remaining ingredients and mix very well; season with salt and pepper to taste. If making ahead, cover and refrigerate the tuna salad. 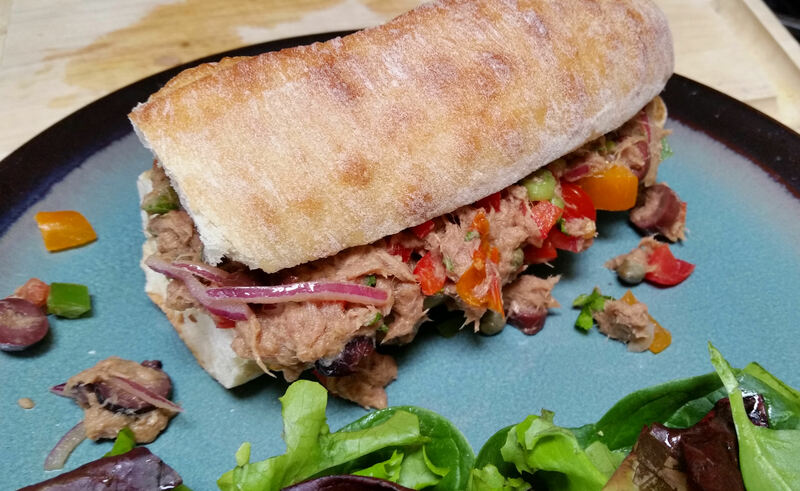 Slice baguette in half horizontally and place several large spoonfuls of tuna salad onto the bottom piece. Place the upper half of bread on top and press down to compress the sandwich as much as possible. 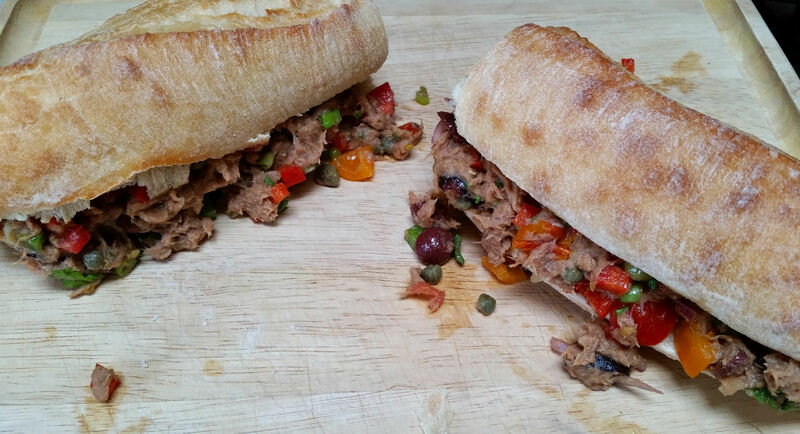 Either serve immediately or allow sandwich to sit at room temperature for up to an hour before serving. 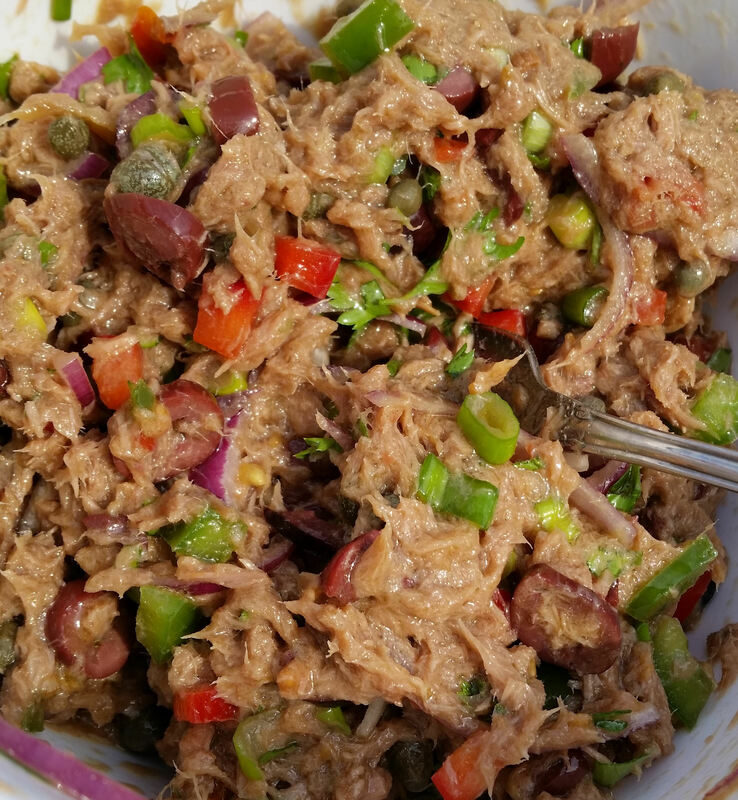 Note: If refrigerating the tuna salad for later use, allow it to warm a bit prior to serving. It just tastes better served lightly cooled or even at room temperature. Enjoy! 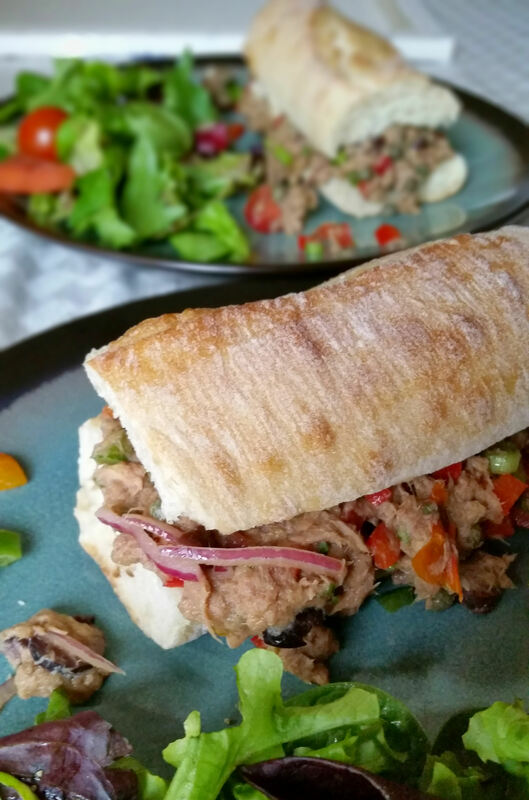 Makes four 6-inch baguette sandwiches or eight ciabatta roll sandwiches. Recipe adapted from the cookbook Prune. Get all your ingredients ready to go. 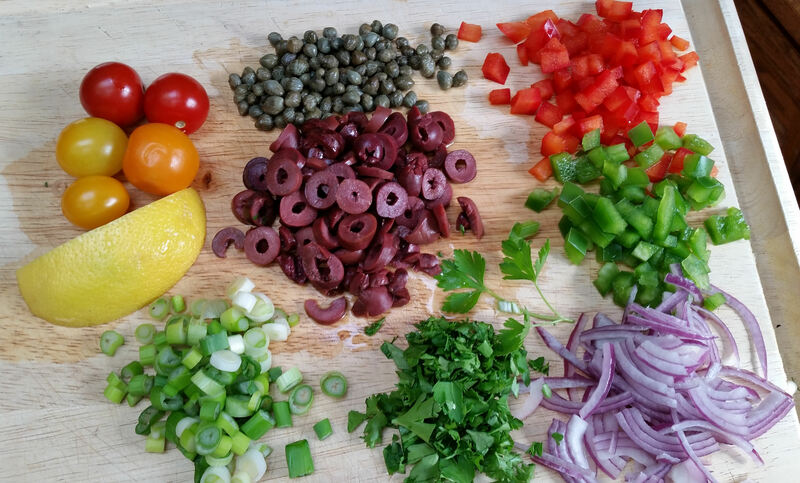 Admire all the bright colors and pat yourself on the back for making such a healthy and flavorful meal. 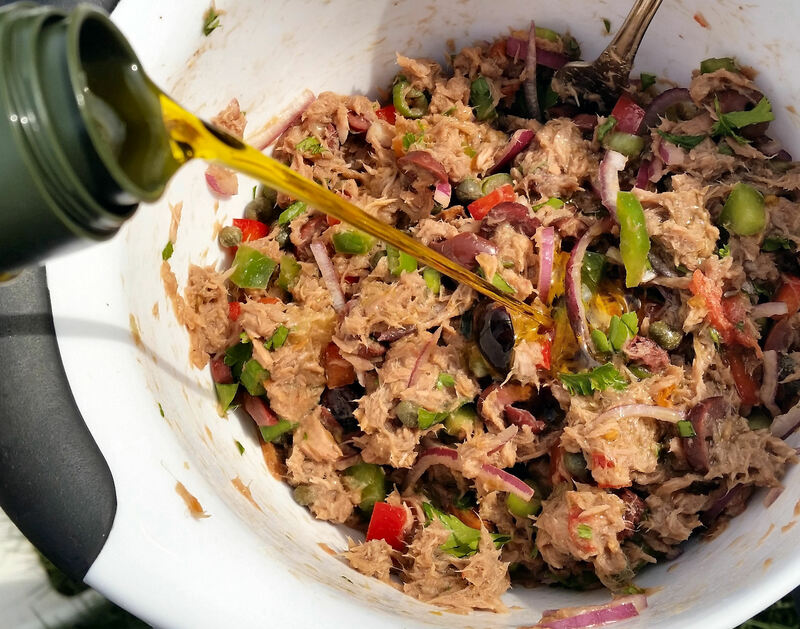 Combine the tuna, balsamic vinegar and lemon juice in a large bowl; mix well. Stir in all the remaining ingredients and mix very well. I like to add the olive oil last. I don’t really know why, and I’m sure it doesn’t matter when you add it. Season with salt and pepper to taste. You can cover and refrigerate the tuna salad at this point for up to 2-3 days. Just let it warm a bit before serving. It tastes a lot better at room temperature than ice cold. Cut baguette in half, and slice each half horizontally. 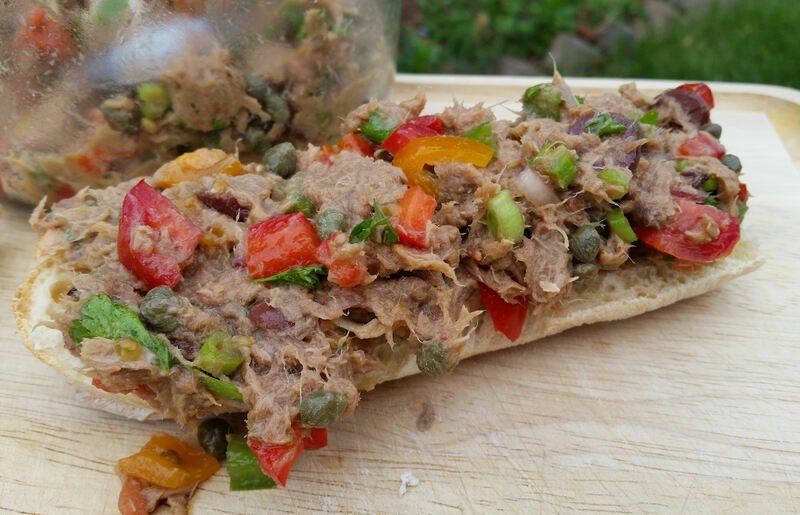 Place several large spoonfuls of tuna salad onto the bottom piece. Really pile it on there. In fact, you could probably even serve these open-faced, just like this. Place the upper half of bread on top and press down to compress the sandwich as much as possible. It’s okay to serve them right away, but they’re even better if you let them rest for up to an hour so the liquid can soak into the bread a bit. Plate the sandwiches and serve with mixed greens for even more color. Enjoy! Nom! Excited to make more from Prune book.